There's nothing like shoveling snow to make ya wish you were still on summer vacation. 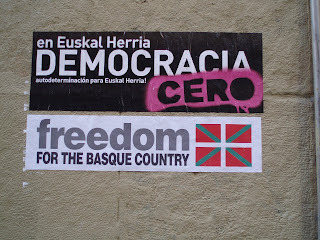 Back in August 2007, m friend, Emma, found us some cheap flights to Bilbao from London (oops... I'll post that one later). I didn't really know what to expect of Bilbao, other than it was in Spain and they have a pretty good football (soccer) team. I was immediately impressed. 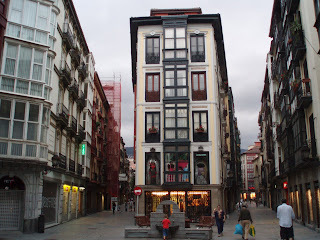 Bilbao centre is lovely, with beautiful colonial buildings, ultra-modern transit system, and great shopping. After talking to some locals we discovered it was revamped a few years ago and now has some very strict bylaws to keep it clean. In fact the street washers were constantly going up and down them, chasing the pedestrians (like me) out of the way with their spray. 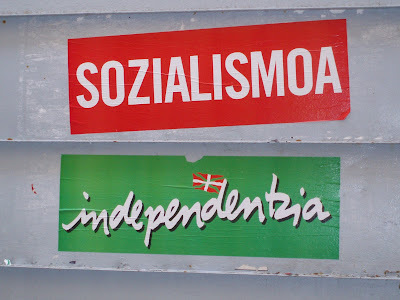 We learned very quickly that there is a vast difference between Spain and Basque country. On our first night we met a German, who who works in the area. Hospitable, as per most Germans, he treated us to the tradition of going from one tapas bar to another, kind of like a pub crawl. 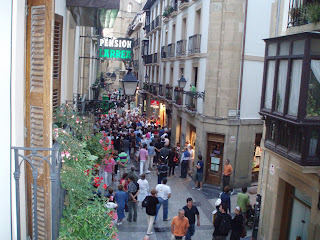 We sampled delicious tapas, or pintxos in Basque, zurritos (small glasses of beer), and txikito (red wine). Pintxos/tapas are appetizers such as olives and cheeze or fried squid served on a piece of bread. The last tapas bar we ended up at kept us there all night. 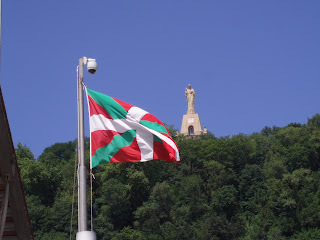 They taught us that they speak Basque before Spanish and enforced upon us their best food and drink. We were served a platter of nutty ham (apparently the pigs are fed on acorns). It was unbelievably delicious. I was making up for lost time in Russia, where the food wasn't so great. In fact, it was so damn tasty that I ate it all myself (Emma's a vegetarian), while the bar tender kept my 'txikito' full. Completely satiated, we stumbled home at dawn. An hour later, the after affects of my over-indulgence (gluttony) set in. To this day, I cannot look at ham without feeling sick. Since every tapas bar has rows of ham hung out on top of the bar, the reminder of that night stayed with me throughout the week. 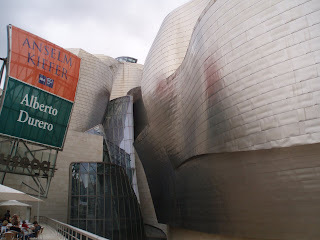 Apart from eating and drinking, we also checked out the Guggenheim museum, designed by Canadian-born Frank Gehry. There's some pretty funky modern art exhibited inside, but I was more impressed with the building, which was designed to mold into the landscape. 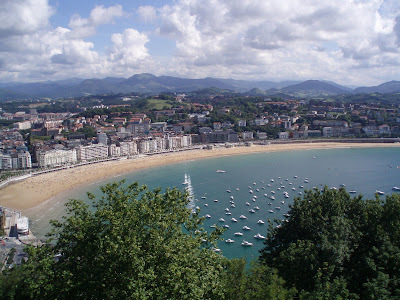 The next day we headed to San Sebastian, a couple hours further east along the coast. Contrary to Henry Higgins and Eliza Doolittle, the rain in Spain does not stay mainly on the plain, but we did manage to get a half day of sun on the beach. There's a fair amount to do there anyway, such as museums, day trips, spas, and, of course, tapas bars. This one was below our hotel room. People were singing on the street all night. There's still a strong ETA presence here. Our guidebook warned us what coffee shops to avoid, and we noticed a constant replenishment of fresh stickers on buildings marking their territory. 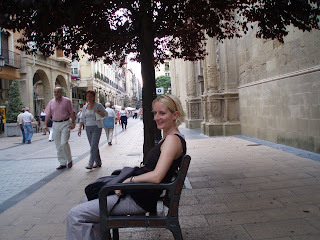 A few days later we took another bus trip to the heart of wine country... Logrono in La Rioja, where it continued to rain. We had high hopes of wine tasting, but discovered most of the winerys around were closed and the few that were open needed advance tickets. Bad timing, it was holiday week. We still managed to find cheap, good wine, and good eats. 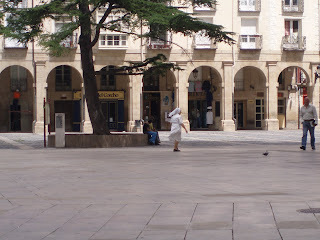 The Camino de Santiago, also known as Way to St. James, passes through this city. This pilgrimage has existed for over a thousand years. Santiago is supposedly the buriel site of the apostle, James the Great. We saw plenty of pilgrims with their walking sticks and pilgrim passports, allowing them cheap, or sometimes free, accommodation and food. Once they've travelled 100 km and have proof of stamps and dates, they're entitled to Compostela, a certificate of completion. I'm not sure if that means these christians get to heaven quicker or not, but I just might try that one of these days. My favorite part of this area was the people watching. 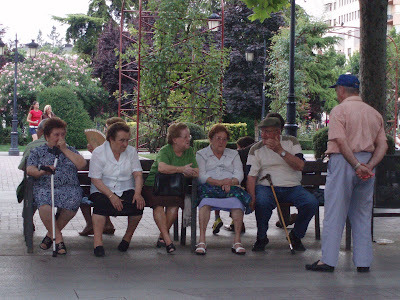 Aside from the pilgrims, the sweet little old Spaniards were charming and seemed to have a pretty good social life. Although one day I was approached in an over-friendly manner (a lot of groping and kissing) by one supposedly sweet little old man while sitting at an outside cafe writing postcards. Fortunately, a grandmother pushing a little baby saved me. We had a great laugh and conversation afterward (not understanding eachother other than poco loco (a little crazy), referring to the old guy. 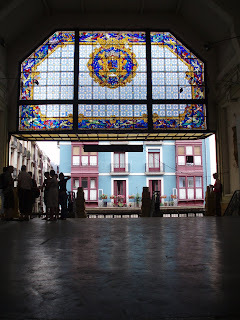 After this small dose of Spain, I so want to go back and see the rest of it. Ilsa recommends.